receiving the sacrament of reconciliation. • Paul’s letters always start with a warm greeting. Later in his letter to the Corinthians he will warn them that although they are ‘not lacking in any spiritual gift’ (many were celebrating and boasting of gifts of tongues, healing, prophecy etc) it had turned into a competition. Pride had turned them away from Purpose. ‘You were called to fellowship with Jesus’. What change do you desire this Advent? ‘house’ in proper order. What would Jesus find if he returned now to the home of your ‘heart’? Your family / home? Your Parish Community? Do you feel a ‘servant responsibility’ to make the Masters home ‘ready’? • The Advent challenge of being watchful and alert in ‘waiting’ is problematic. Watching and waiting can be boring. The command to ‘watch!’ could also be understood to watch out for opportunities to live as Jesus commanded us (remember last week: feeding the hungry, hospitality to the stranger….) so as to be found ‘ready’. Examine the past week and explore what you have ‘seen’. How could you be more watchful and alert to seeing Jesus hidden in daily events of your life this week? • What is one action that you will do to ‘livetheword’ this week as part of your Advent journey? 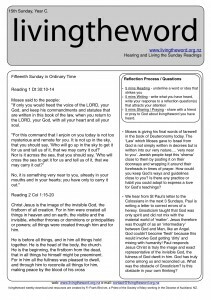 livingtheword weekly download and resources are created by Fr Frank Bird sm, a Priest of the Society of Mary. 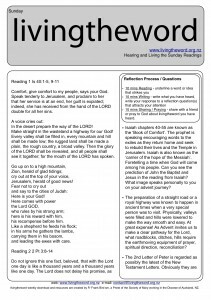 Administered by Bev McDonald, Marist Laity NZ Facilitator. web: www.livingtheword.org.nz www.maristlaitynz.org e-mail: contact@livingtheword.org.nz. The 1st Sunday of Advent marks the beginning of a new ‘season’ – and a new Year (the Gospel of Matthew). Advent prepares and challenges us to be ready to welcome the second coming of Jesus and then turns us to celebrate and remember with joy the first coming of Jesus. Will you celebrate Advent AND Christmas? What do you do to celebrate and welcome a friend? How could these expressions be practiced toward Jesus this Advent / Christmas? As the Christmas season and advertising moves us toward end of year celebrations and ‘climbing up the mountain’ of the ‘shopping mall’ how could you also give time for your friendship with God. Consider an Advent commitment to an ‘hour to be awake from sleep’. Use your imagination to reflect what it would mean to ‘put on the Lord Jesus Christ’. Is there anything you are doing in your life that Jesus wouldn’t do? Jesus uses three short parables to break into our Christmas comfort zone. A sudden flood is something tragic unless one is prepared ahead of time. What does ‘building and entering the ark’ mean today? What else is there to do beyond ‘eating and drinking, marrying and giving in marriage’? Imagine your work colleague, friend, family member who you live ‘side-by-side’ with each day is suddenly revealed as different in Gods eyes. A parable shocks our imagination with a surprise to make us change our life. Do you wish to be taken into a deeper relationship with God or to be ‘left’ alone ‘in the field’ or ‘at the mill’. What would divine perception see in you which human perception cannot see? To stop a thief entering your house you have put in place certain practices or habits (locking doors and windows, turning lights on, having mail collected by a friend…) so that you are ‘always ready’ ‘awake’. What spiritual practices could you commit to so as to constantly keep ‘spiritually awake’? Have you been ‘broken into’? What wisdom for the journey was discovered to guide your future? A famous retreat leader had hundreds of excited people waiting for very wise words and deep insights into their problems. He arrived at the microphone and asked: ‘Hands up who wants to go to Heaven?’ Everyone put their hand up. ‘Hands up those who are ready to go now’? No-one put their hand up. He said: you may consider asking yourself why you are not ready… Are you ready? As Christmas arrives, special passages of scripture are used to guide our understanding of Christmas. This Sunday is the only time that the Prophet Micah is used for our Sunday Readings. A prophecy 700 years before Jesus points to the little town of Bethlehem, famous as it was the home of Jesse, King David’s Father. It was from this royal line the Messiah would arrive. Ephrathah was a little and insignificant ‘clan / tribe’. Consider for a moment just how extraordinary is God’s power to guide history and prophecy to fulfillment. How might this help you ‘trust’ in God? 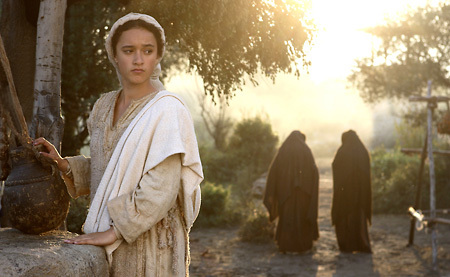 This gospel scene of Mary ‘visiting’ Elizabeth aims to show us more than the greeting of two expectant mothers or that Mary is a caring young woman to her older cousin. Behind this scene are layers of stories. Mary, a ‘new mother’ (New testament) stands before Elizabeth an ‘old mother’ (Old Testament). Behind Elizabeth is her husband, Zechariah the High Priest of the (old) Temple. Within the Temple rests the ‘Ark of the Covenant’ where the 10 commandments were kept housed in a special box (Ark) called the ‘Mercy Seat’. Mary bears within her the Saviour child ‘God-is-with-us’ and is now the New Ark of the New Covenant. The little boy John the Baptist leaps for joy within the womb of Elizabeth like King David leapt for joy and danced before the Ark of the Covenant (2 Sam 6,14). The deepest and true response to God being ‘enfleshed’ among us is to ‘leap for joy’. When was the last time you ‘leapt for joy’? Why is little baby John ‘leaping for joy’? How could you show the experience of joy more this Christmas? The gospel of Luke focusses upon Mary who always acts on what she hears. Her ‘visit’ to Elizabeth is a ‘response’ to hearing God’s voice (through the angel). Mary is ‘blessed’ but firstly it is because she ‘believed what was spoken to her’. Christmas becomes no longer simply an historical story for us when we recognise we too are called to allow the ‘Word’ to become ‘Flesh’. Today. Now. In the world. What words have you heard from God, in prayer, through others. How could you act on them so that they become ‘flesh’? Real? Acted out? Bring God’s presence? What words or promises have you made that have not been fulfilled? Advent is a time of joyful preparation. In the final days before Christmas how could you achieve a balance: writing Christmas Cards and the Call to Conversion. Christmas Parties and Prayerful Preparation. Christmas Presents and Christmas Presence? The Prophet Baruch shares a beautiful image for Advent. Have you noticed when you take off ‘old clothes’ and put on ‘new clothes’ there is a sense of joy and a new ‘attitude’. In ancient times, when a significant transformation happened a ‘new name’ was also given. Like last week, Jerusalem – which is us in the Church today – is invited to prepare by shaking off the old and putting on ‘the cloak of justice’. And, our new name is to be ‘Peace of Justice’. What old ways of mourning and misery would you like to leave behind this advent season? How could your life reflect Gods hope for you of ‘peace’ and ‘justice’, ‘glory’ and ‘worship’? The city of Jerusalem is on a hill. The view from the top of the Temple could see all people’s coming from every direction. Can you glimpse God’s hope wanting us to stand up and invite everyone ‘home’ to Church this Christmas? 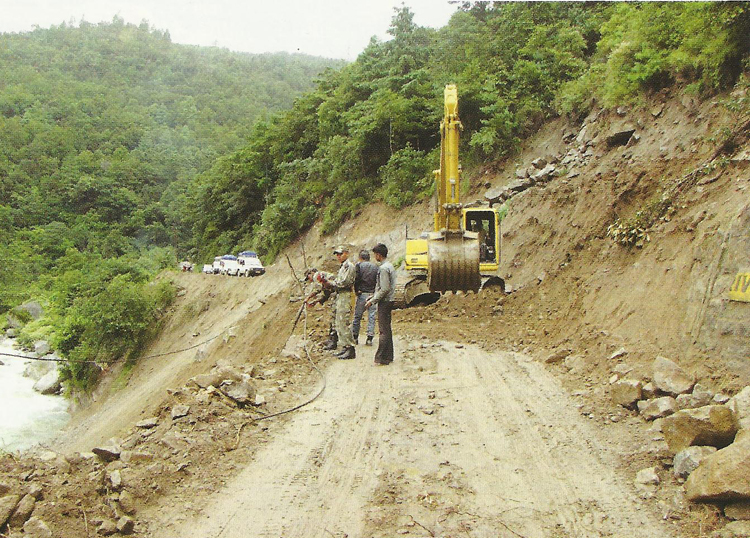 Through us, mountains and gorges – difficult pathways – will be made ‘level ground so people can return easily. Mercy and justice will be our story and song. Do you know anyone who is experiencing an obstacle to returning to God? The Church? What earthmoving help could you offer personally to them? Righteousness is an interesting word. In the Old Testament it was a title that was given by the poor to those who ‘lifted up the poor’. A rich person could not give this title to themselves. Reflecting upon the year, would the ‘poor’ give you the title ‘righteous’? In what ways have you lifted them up? Was it charity or justice? Luke, like St Paul, is aware of a claim by courts and rulers that these christian disciples are ‘mad’. Making up strange stories! Luke insists the evidence and life of Jesus is historical. Christianity started in a particular place and time in history. In the 15th year… etc. With a great twist Luke lines up the different rulers of the time. Traditionally when rulers returned victorious from battle, people would line the streets and shout triumphantly: ‘Lord, Saviour!’ Luke is turning attention to the true Saviour – Jesus – whose preparation victory voice is John the Baptist. How would you personally describe Jesus as ‘saviour’? Celebrating the advent practice of reconciliation (confession) encourages us to ‘prepare our hearts’. When a great King visited a city, workers were sent to straighten pathways, cut into mountains, level valleys. Consider the effort involved to welcome the King! Reflect on this image and the famous words of John. What needs to be straightened out and filled in? How much effort will you put into Advent? 1st Sunday Advent Yr B – ready and waiting!